The instructions to create the Stars is only sent via e-mail and includes all of the information needed without the kit. The kit is only to get you started and only one is sent to an organization or address. The kit has 2 washed cantons, 100 pouches and 10 completed Stars for $13. Stars are not sold, but you can receive donations to cover supplies. It will be your responsibility to locate retired flags, purchase pouches and print the notes and share the Stars. We have sufficient Stars to handle our requests. Your organization's name or website may be included on the note above the Star website as shown in the examples. You will also receive the note with your zip code. We can update your notes as needed, all transmissions via email. Please be clear with the name of your organization, chapter, etc. There is only 17 characters including spaces available for each line, two lines maximum. Any PayPal entry above the suggested $13 for the Star Maker kit will be considered a donation, as only one kit is available per organization. "I am part of our American flag that has flown over the USA. I can no longer fly. The sun and winds caused me to become tattered and torn. on this website will be considered a donation. This is the note you receive with the instructions - with your zip code. Why the Zip code on the note? Someone received a Star from a VA hospital that was over 300 miles from any of the Star Makers in the organization. He wanted to donate retired flags as well as give a donation to help support the work. We had him mail the flags and check to our address. How to create an easy means to designate a Stars origin? It was decided to use the zip code system as it designates an area and everyone uses a zip code when they sign up. It helps to track where your Stars go. People contact us through the website and we ask if there is a number on the note. They explain how they got the Star. Sometimes they want more, and we are able to give them your contact information. The below link is for only one Star Maker kit for one person/organization. Instructions are e-mailed prior to the mailing of the kit. Communication is sent to all Star Makers at the end of 3 months. At that time, please let us know how you are doing and if you are continuing as noted to the right. Submit information before sending donation. You will returned to this page to pay for Star Maker kit. This is a 2 part process to pay with PayPal. 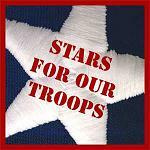 How did you find out about Stars for our Troops? How or where do you plan to share the Stars? Will you be ordering a Star Maker Kit? 2. Special Order Stars we create for you. Clicking on your choice will take you to that page.